I just love sarees. Be it the soft feel of my grandmother’s well-worn Cottons and Muls as she held me close to her while narrating stories. Or the floral jaal and pastels of the Doria Kotas that my mother wore every day. And that rare glimpse of printed silks worn by Jaya and Raakhee in the movies – bold colours, keri motifs and retro patterns. The saree held in its folds and pleats all the beauty and grace that I could comprehend in my early years. The clincher however was when I wore one. As a part of the coming-of-age ceremony, a Parsi girl is gifted and allowed to wear her first saree. A dull grey Chiffon was chosen to be my first saree. As it was draped around my gawky 5 feet 7 inch frame, the ethereal flowiness of the chiffon forgave and even embraced unconditionally all the barriers nature put in its way. I felt and looked like a princess. So this is why women wear sarees – it dawned on me then at that very moment. And that belief has not left me since. Over the years I continued to enjoy looking at and loving sarees worn by other princesses around me. The staple Cottons and Muls, Calico voiles, floral printed pure silks, embroidered Nylons and plain Georgettes, heavy Banarasis, the righteous and sturdy Khaadi, the elegant Kanjeevarams, the bright Bandhanis, the gaudy, loud faux Gaji silks, slinky Chiffons…all were loved by me. Heck I even loved the once-bright but now faded Puneri worn by the vegetable seller lady. Fat, thin, tall, short, dark, wheatish, fair, short hair, long hair – nothing mattered to a saree. It would, in flash of a wrap, transfer all of its beauty to you – taking nothing in return. The saree could lend you height, slenderness, grace, dignity, all of it in a go. Why an Ilkal saree could even lend you character in an instant if you needed it. How could anyone not love such a garment? As I grew older I discovered an entire world of sarees unbeknown to me. Bhalucheris, Paithanis, Ikats, Tangails, Patolas…gasp. O okay I thought. One saree for every state in India. That made sense. But I was so wrong. The sarees had nothing to do with states per se. What would be a good way to organize and get a list of the types of sarees? Would the list be based on the weave? Or maybe the fabric? Or the embroidery, or the region or… god what else? See I needed to have a list. I needed to know because I wanted to own each type. And more I looked for a definite list the more I got tangled in its warp and weft. Somewhere along the way my active search for the list became passive, very passive in fact, as I decided to become someone more important than a princess. There was no time for a saree. Sorry saree. And besides, I just could not keep track – there were so many types. I could not possibly know them all or even have them all. In my years of being important, I never stopped loving sarees and continued learning and reading about them – through books, knowledgeable friends and my masi, my biggest source of information. Through the weaves of this garment I discovered my country’s history, traditions and culture. I understood how saree craft was at one time tightly woven to the economics of a region. And my love for the garment continued to grow. Today I still have not found my list of sarees and I firmly believe that there can never really be one. Though I no longer care to own each type, I definitely do not want to stop discovering more of them. I believe there are sarees out there that I do not know of yet. And I doubt that my enthusiasm will be any less than what it has been in the past. Through this blog I wish to celebrate the infiniteness of that list. I wish to take time off from being important to share the beauty, grace and character of a saree with you. I hope to bring you all this beauty in an alphabetical listing that defies types and categories of fabric, embroidery or weave. 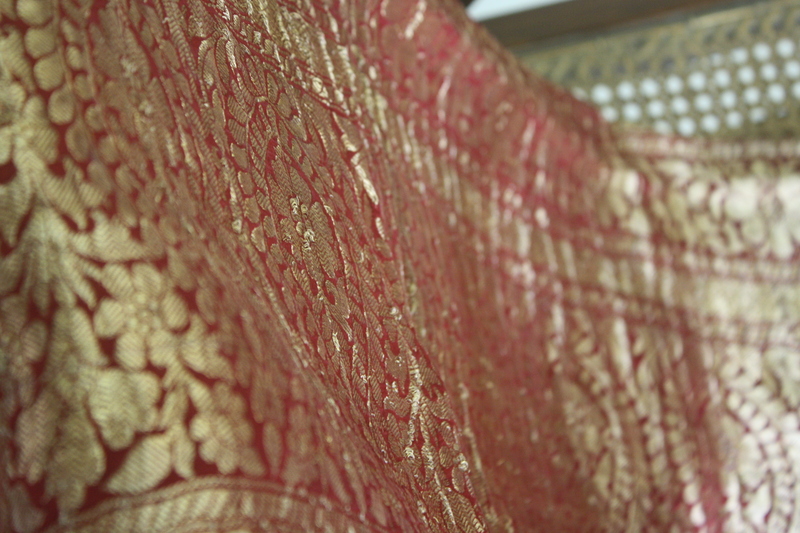 We begin with A – A for an Assamese Gheecha saree. That’s for next week. Source: Sectors near and around 1110AmH290a of my own long term memory. Thanks Punam for reviving our tradition. Looking forward to such more blogs so that we can educate ourselves more about this six yard long cloth and Yes, I too believe, nothing makes you look as elegant and as beautiful as a saree does. Thanks for reading and liking this blog Shammi! Thanks Nehal. Means a lot coming from you! Thanks Arundhuti. Will look forward to more suggestions from you. A saree adds to the elegance and grace of a woman . Sarees have always been my most favorite attire.Something I love to wear no matter what the occasion. And its awesome to see this extraordinary blog dedicated to most elegant Indian wear. Punam congratulations!!! Very beautifully written . I love sarees and now feel like possessing each one you have written about. Just love the title. Write more write soon. Thanks Nina. So glad you liked the title. I could not think of anything more Indian and more appropriate! I couldnt agree more on every aspect of your essay. It has never ceased to amaze me, the completely new dimension a saree adds to the persona and beauty of any woman. Keep the thoughts flowing. Am watching this space, girl! Jamshed, I am so thrilled you read my blog. Please read them all and feel free to give me any suggestions for making it peppier! So you started a blog. Cool. To explore the infiniteness of your love…even cooler. And you are using sense impressions to convey that. Nice. May I make a suggestion? As someone not really interested in sarees and sensually challenged but who loves stories. How about weaving a story around it? Could be a story handed down by tradition or one you make up. maybe one that ties a particular saree to a person from our myths. Rajiv, delighted that you read my blog. I loved your suggestion. I will do what I can. Yes Atul. The never-ending nav-vaari or 9-yards! Thanks for everything, soon posting more. I don’t know the first thing about Sarees and I’m terribly challenged when it comes to fashion and art… but I love compilations. I’m going to make an effort to learn about this vast world of Sarees through your blog. I will also have my mother-in-law read this as she is very passionate about her collection of sarees.